Steadicam gives the director the ability to fly the camera without tracks, up stairs, through doorways, anywhere the operator can go. It also distributes the weight directly onto the operators body, so extended shots are possible. Our steadicam can fly most cameras with ease so you don’t have to use a lighter ‘B’ camera for dynamic shots. 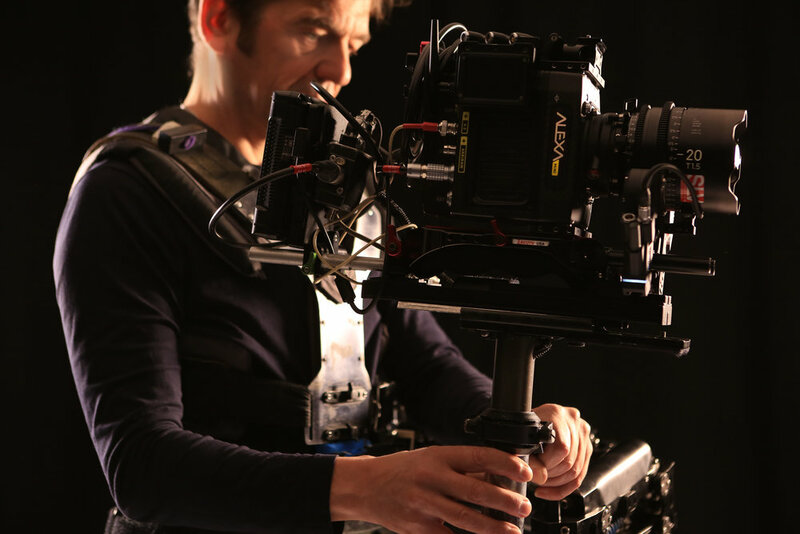 Scroll down to see Alexa Mini, Sony Venice, Red Epic Dragon and Aaton mounted on our rig. 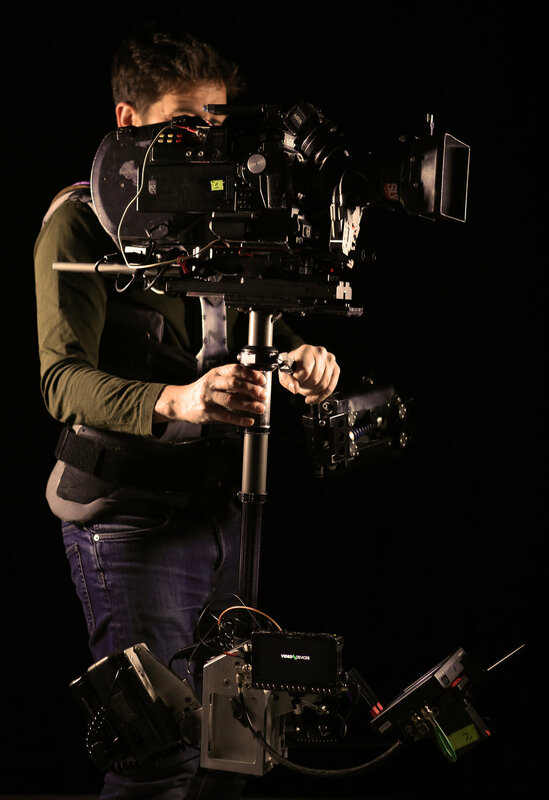 Steadicams give the camera massive inertia and takes the bounce out of the operators step, unlike electronic gimbles which stabilise pan tilt and yore but not vertical and horizontal movement. This makes the steadicam movement feel natural, in fact most of the time the viewer is un aware of how the shot is made. The video below was all shot on our steadicam, one operator (Michael O’Halloran) , one focus puller (Andreea Gruioniu) two panel lights, and an ipad for playback! (courtesy of music producer Will Mount WTS records). The speed with which you can setup a shot frees the director up to play with alternatives. In the opening sequence the camera is above then alongside the singer in the same shot, then able to twist in the mirror shot playing with the horizon. We were able to shoot on a busy high street as there is no track, the rig is in effect hand held, you can take it anywhere. The night shots were grabbed in a park just as the light went, again set up time was minimal and as they closed the park we just walked out, no de rig! Generally we need a dedicated focus puller but the Tilta follow focus system does enable the steadicam operator to control focus and iris as a solo operator. I’ve worked like this and in a controlled environment (ie filming a band in studio or on stage) and it works really well. We shot most sequences at 32fps to give a graceful feel and edited and coloured in FCPX. Playback was from an ipad going into a portable speaker with a visual timecode to help with the edit. The kit we have is designed to get the best results at a very reasonable cost, putting steadicam firmly within tv and promo budgets. Canon C300 Mark 2, used for ‘We got this’ music video. Our Canon C300 mark 2 is a great super 35mm 4K / 2K camera which accepts EF mount lenses. We used our Samyang T1.5 cine primes (16, 24, 32, 50, 85mm) which are very fast inexpensive lenses. Our Tilta Nucleus-M lens control follow focus / iris, and our Hollyland Cosmo 400 video sender made focus easy. This is by far the most affordable rig and can give great results. For productions which require feature film lenses and cameras, we are working with SLV to put together a number of packages featuring Arri, Red, Aaton and Sony cameras with various lens combinations, see below. Made for steadicam this Super35 gem takes PL mount lenses and makes beautiful pictures. It’s light and small so great for working in confined spaces and is of course a great match for the Alexa. It lives! Super 16 with modern low light stocks, fantastic organic pictures, slomo up to 75 fps, if you want the film look here it is, various zooms and primes available. I recently worked with D.O.P. Franklin Dow on the Bilderbuch promo ‘LED GO’. The steadicam set up pictured was used for all the moving shots within the giant pool table set up, including the 360º rolling flip shots. The director wanted everything shot in camera, no post trickery, the look is unmistakably film and whole system was a joy to use. The Venice produces some of the best pictures of any movie camera today. If it’s good enough for James Cameron then it’s good enough for me! Here I’m using it with the Arri Alura 15.5-45mm zoom, a great all round steadicam lens, a real time saver on busy shoots. This camera will take almost any lens as it has a native E and PL mount. The Venice has dual native iso and can shoot RAW or prores in 2k 4k and even 6k, and has a full frame sensor which can be windowed down to super 35 ( the zoom pictured is a super 35 lens ). CP2’s or the new PL Sigma Cine primes work well on this rig. Red cameras get better all the time and this 6K beast produces lovely images and can take PL and EF lenses. Contact: michael@flutterbyfilms.co.uk or call 07976279852, it would be great to hear from you.